More Winter essentials for you lovely girls and boys today! Lip colours are my weakness... I actually think I have an addiction and through the hundreds that I probably own I've picked out a few of my total and utter favourites for these darker, colder months! I never used to wear darker shades, I actually used to be super terrified of them, I was a wimp and thought they looked horrific on me but now I LOVE them! Plums, reds - they are da bomb ! 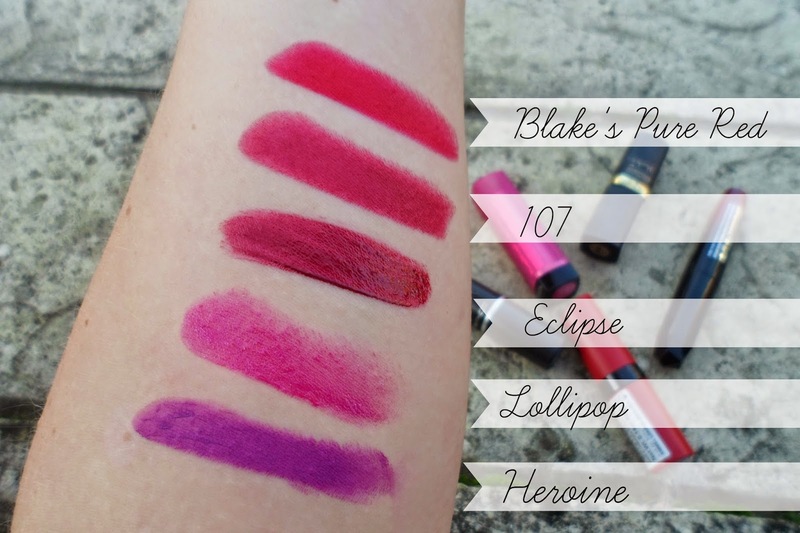 I've picked a mix of different lip products as my favourites as I do wear a variety! Lipsticks, lipbalms, lipglosses I flick between them all depending on the occasion and my mood! Heroine is a colour I've wanted for so so long, I know it has been around for ages but I only actually just managed to pick it up about a month ago! I got it in the Orlando airport when I was flying home at the end of September (hello airport prices!) This is the brightest of the shades I've picked out - as you can;t always been dark and moody! I LOVE this purple colour, it looks amazing on the lips and the matte finish helps it stay on for ages! Lollipop is one of the Colourburst lip butters from Revlon and I have used this for what seems like years! It's the sheerest of the shades I've picked out and is perfect for my everyday look, I love the formula of these lip butters, the nicest ones on the highstreet in my opinion. Eclipse is one of the Apocalips from Rimmel. If you have read my blog for a while you will know how crazy I went for these when they came out and I still use them all the time! They are a great mix between a lipgloss and a lipstick! A gorgeous opaque colour with a lovely shine and great lasting time - these come in so many colours and now they have matte versions out.... which I need in my life! 107 - I think everyone owns this beauty! The Kate Moss range from Rimmel are one of the best out there and this colour is one I would recommend to everyone! Last but not least it is the newest of the lot - Blake's Pure Red from the new Pure Red Collection at L'oreal! 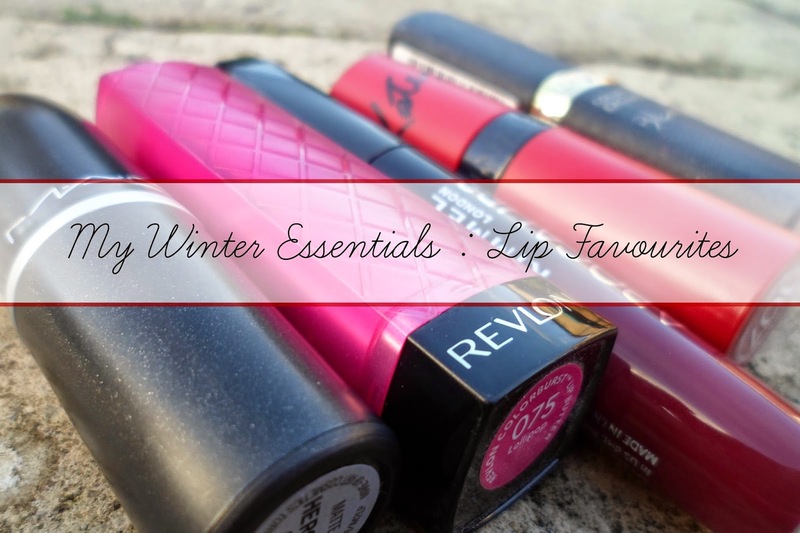 You may have seen my post about this a few weeks ago (here) - I love this red and the whole collection actually - you can't go through winter without a red lippy can you!? The colour of Christmas! What are your favourite lip colours for this time of year? I also LOVE Rebel from Mac, Mystic from Sleek and the Little Mix Perrie lipstick from Collection! I'm on the hunt for a purple lippy and Heroine looks gorge! Loving the look of eclipse! This is such a lovely collection of colours! I bought the 107 Kate Moss by accident but I was actually pleasantly surprised and turns out others love it too! I'm quite tempted to try some more of the Revlon lip butters, I have one colour but it's not the best, not sure whether to give it another go! I love Eclipse - a lovely colour for autumn. we've never been brave enough to try anything purple like heroine before, but we really want to give it a go. Do you normally wear it with a more neutral eye look? I love love the Rimmel london in shade 107! I would love to try out Mac in rebel as well! I'm also a huge fan of the Apocalip - my favourite shade is Galaxy which is also really winter appropriate! The Revlon lipbutter shade looks gorgeous as well!